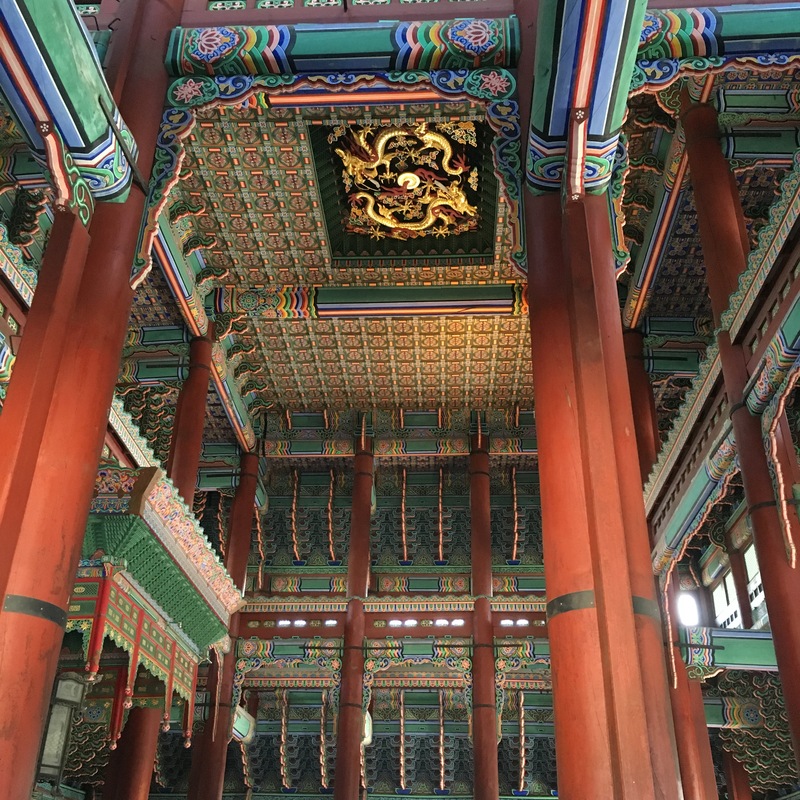 This is an inside view of the gate, called Gwanhwamun Gate that serves as the entrance to the Palace grounds. 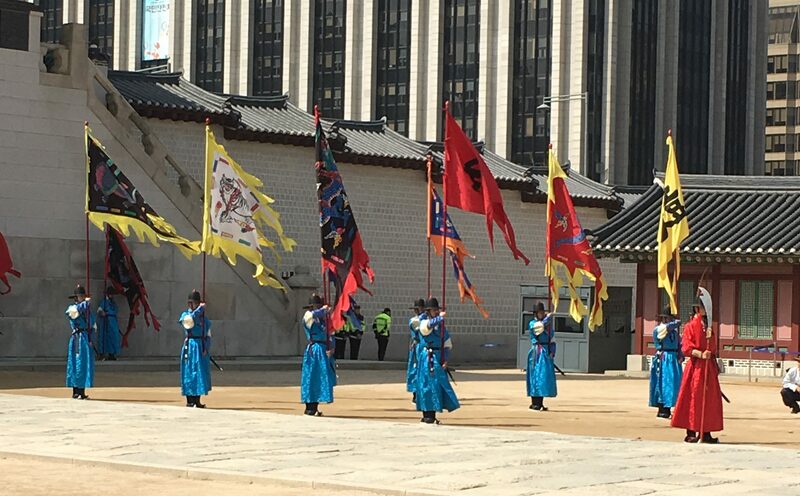 See those guards with the flags at the entrances? 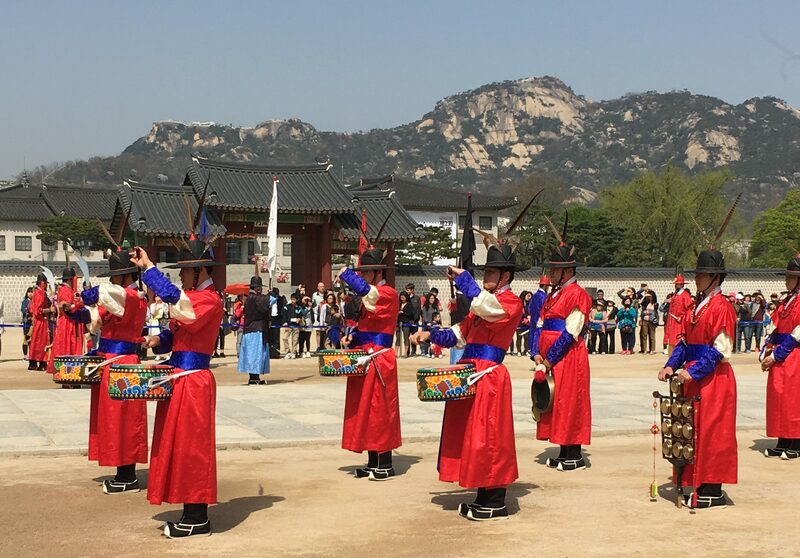 Three times day, there is a “Changing of the Guard” ceremony in the courtyard between this gate and the gate leading to the actual palace. 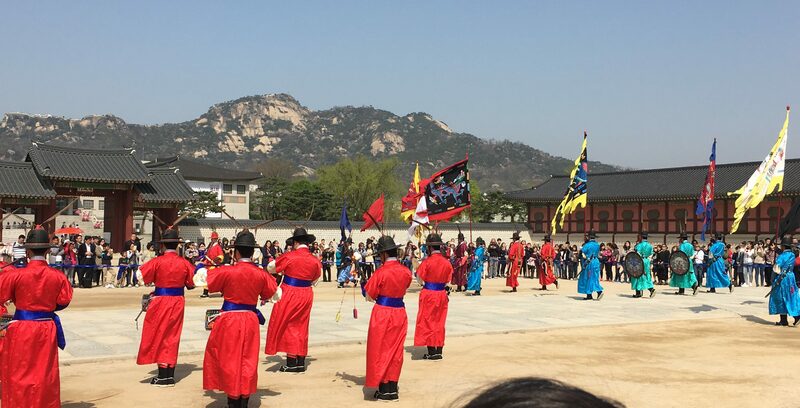 The new guards march into the courtyard along with a parade others playing instruments. 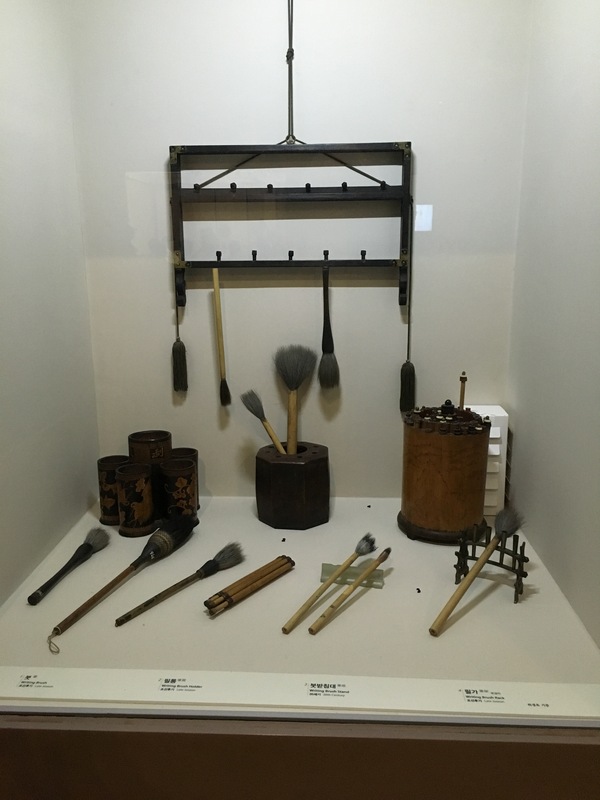 Drums, bells and…. conch shells?? 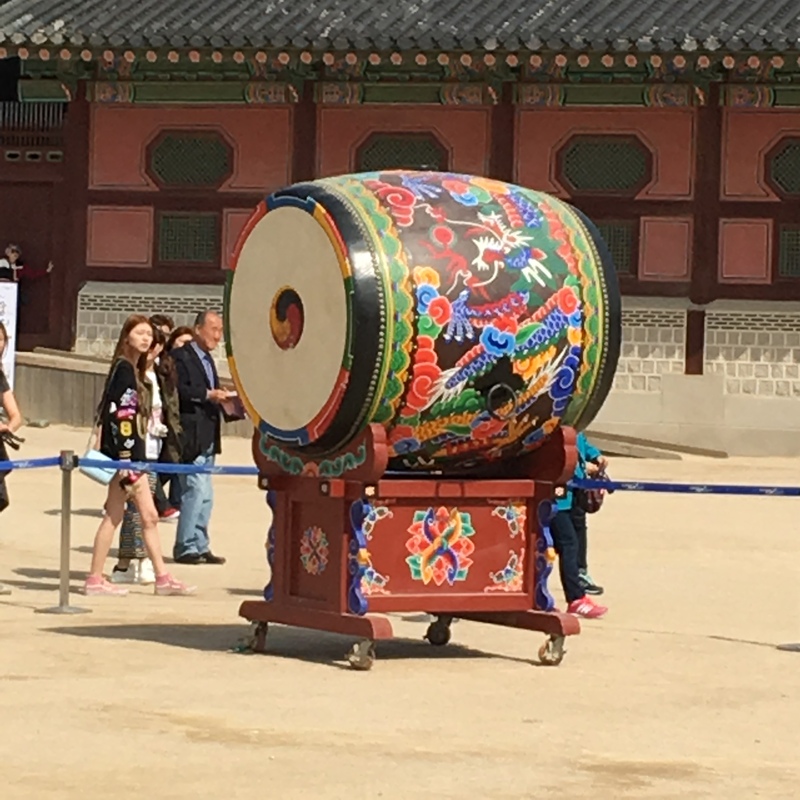 They even roll out a ceremonial drum. 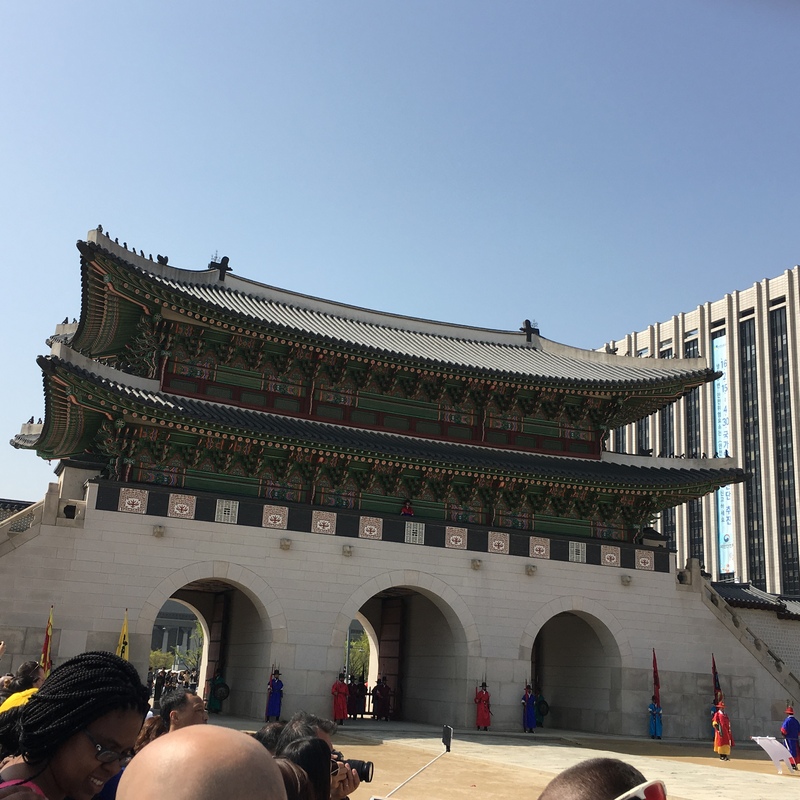 One of the good things about being on a tour is that the tour guide knows where to stand to get the best views….and where to stand so that when the festivities are over, you’re at a good spot to escape the crowd and enter the palace before everyone else figures out where to go next. 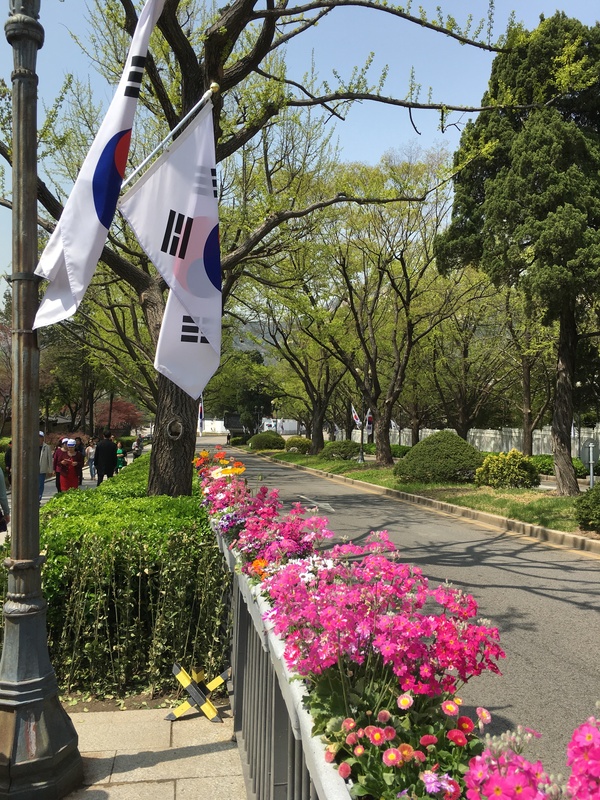 On the opposite side of the courtyard from the Gwanhwamun Gate is the entrance gate to the Palace grounds. Just like at the temple where there is a bridge over a small stream. there is a bridge here too….only there is no water in it. 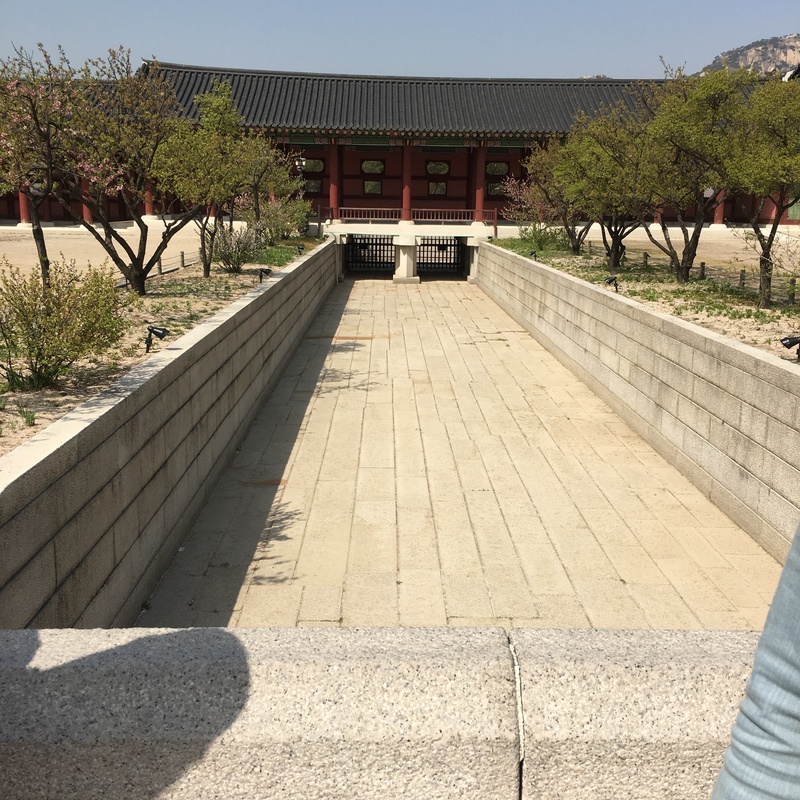 After crossing the non-existent stream, there is a huge courtyard that is on the other side which is where the Imperial Throne Hall (Geunjeongjeon) is located. 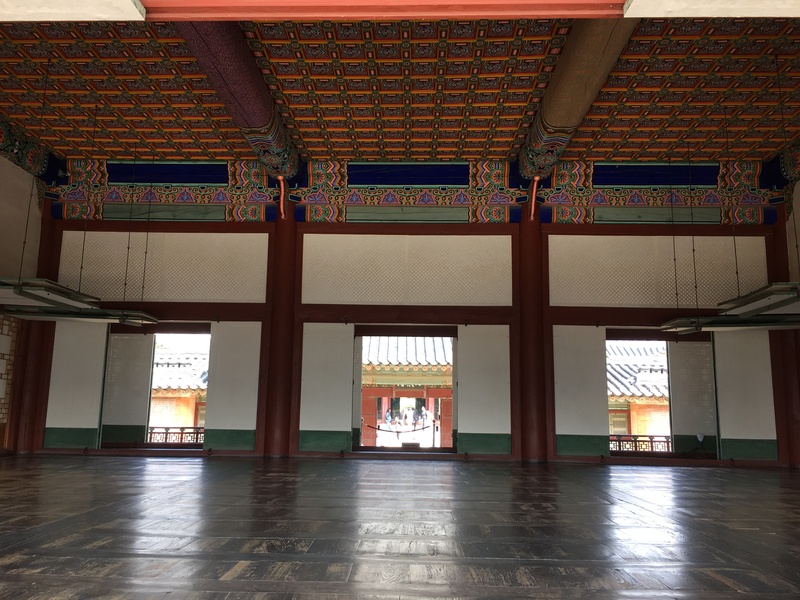 This is where the king was formally briefed by his officials, where he issued proclamations and where he greeted foreign visitors. 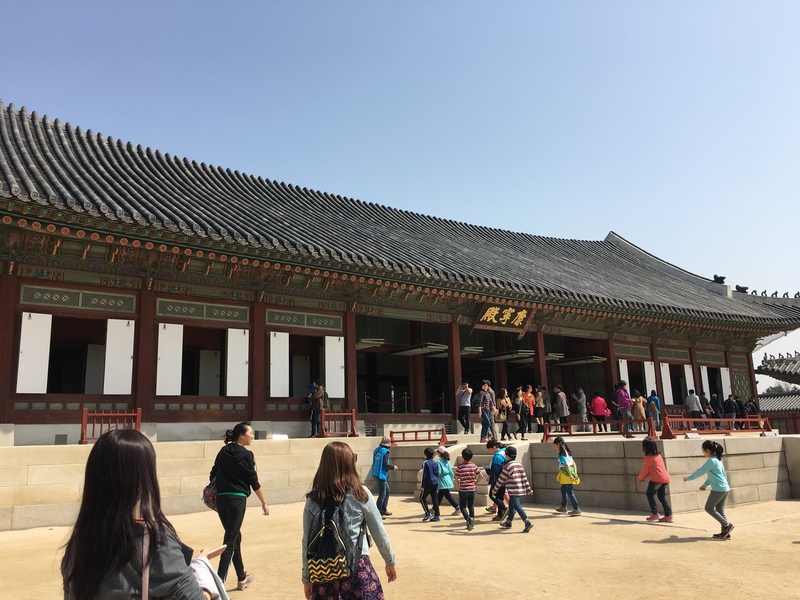 It is also where the coronation ceremonies were held for the royal household. 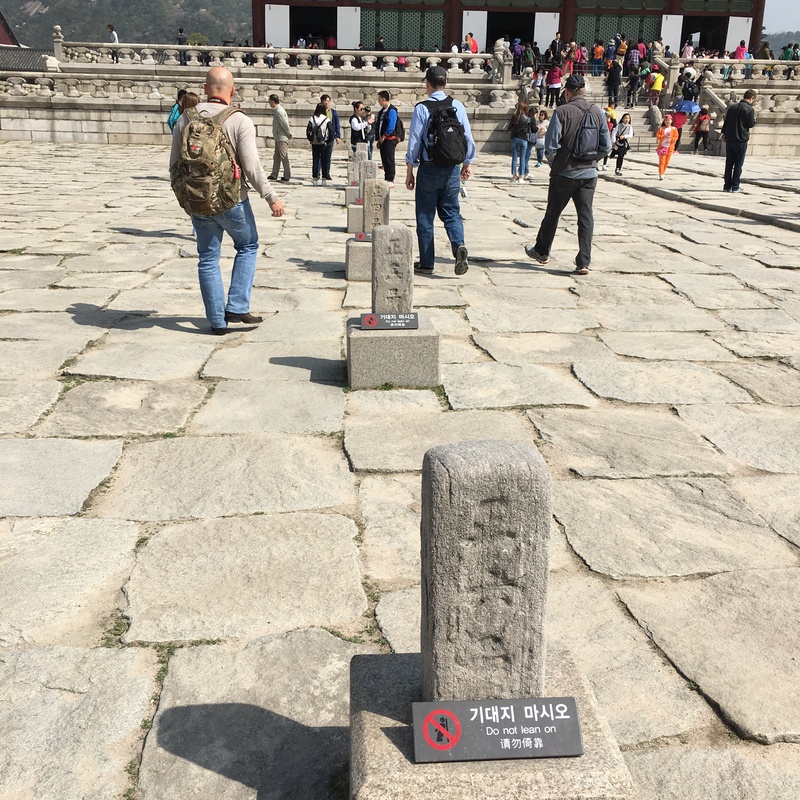 Those cement pylons are called pumgyeseoks or “rank stones” and designate where the court officials were to stand during the royal ceremonies. The higher the rank, the closer you stood to the front. On the ground closer to the front were these rings. 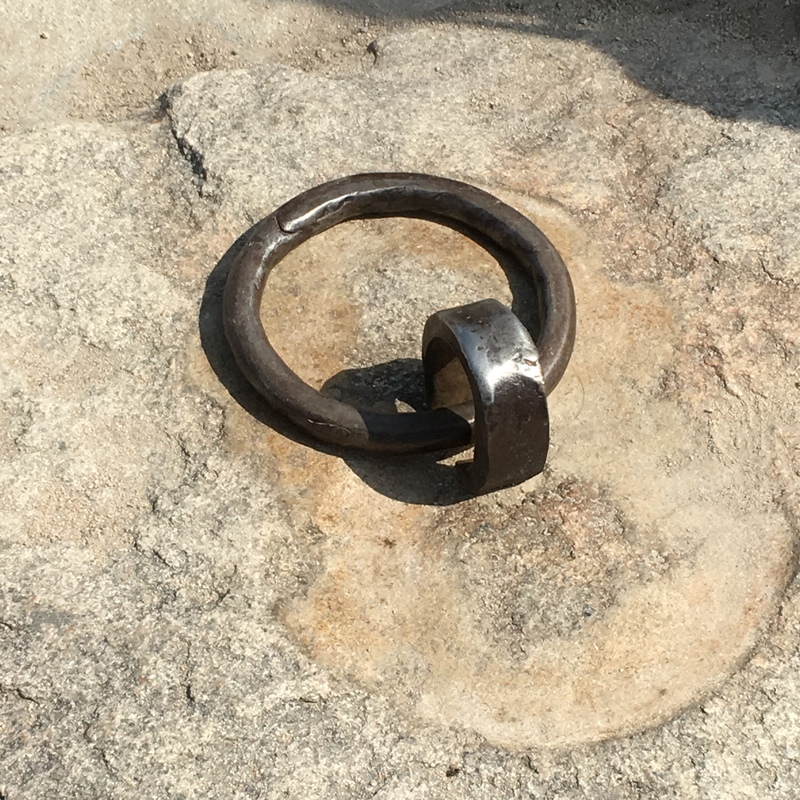 The rings were used to tie down tents – tents that provided shade! Notice that there are no trees…..so no shade. If you were high up in rank, you would be sheltered by the tents. Those of lowly ranks would be standing out in the sun….sometimes for hours at attention….sweating in the hot sun. All the while the king would be sitting on his throne nice and cool inside the Imperial Hall. I just love the architecture and bright colors! Looking up you see this. 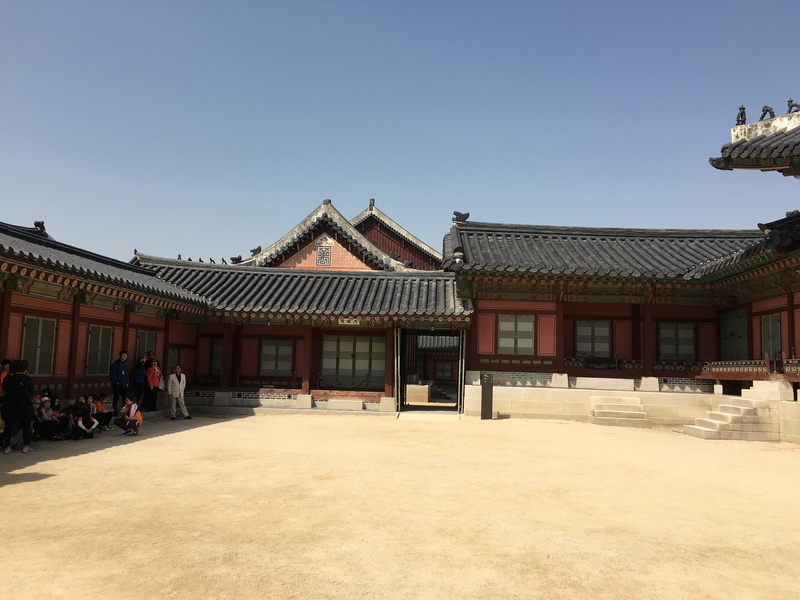 Walking further into the palace complex is the Gyeongjoeru Pavilion. 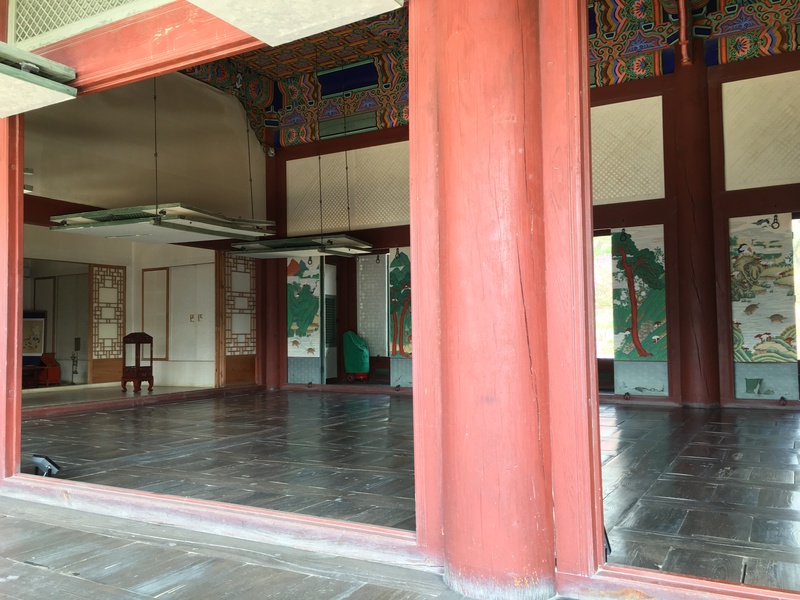 The pavilion was built as a place for feasts for foreign visitors and for the king and his court officials. There have been several pavilions built on this site since the palace was originally built. The first one was replaced by a larger one. That one started to tilt, so it was torn down and rebuilt. 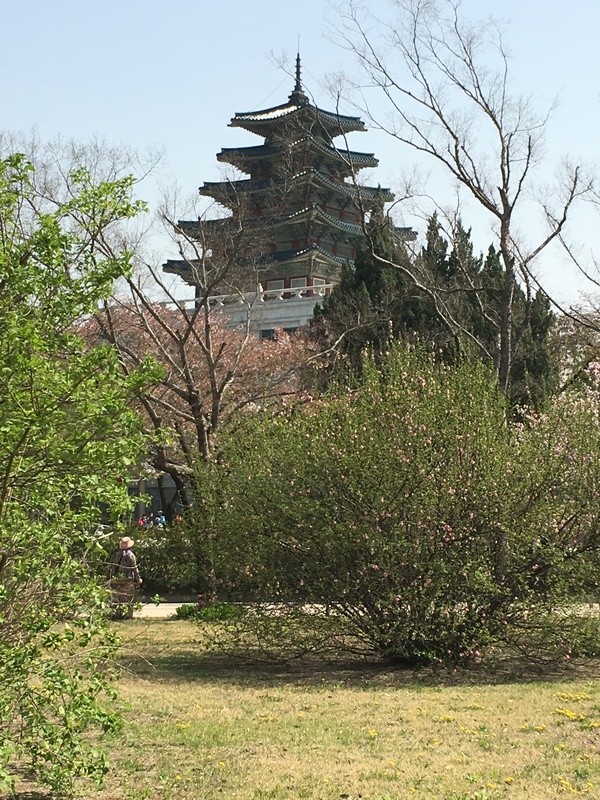 The rebuilt one was burned in a fire during one of the Japanese invasions. 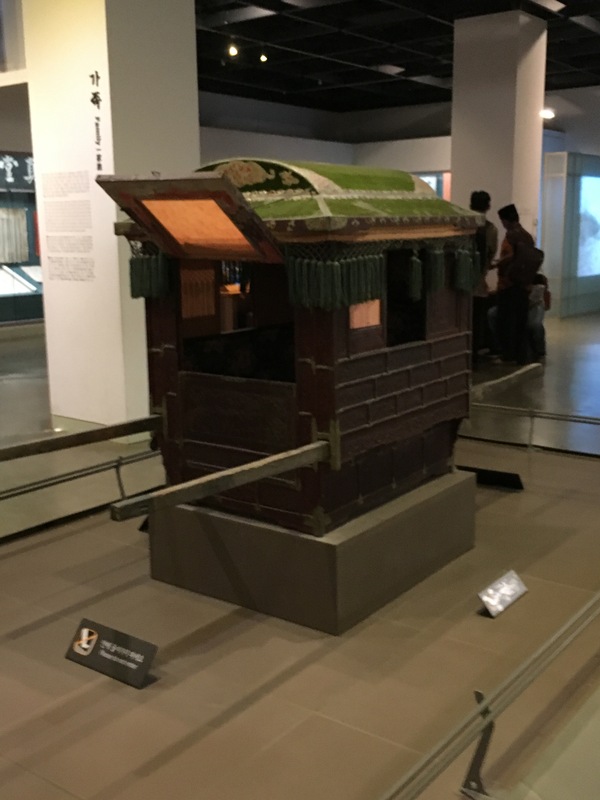 The present pavilion was built in 1867 and unlike the palace which was destroyed, it survived the destruction caused by the Japanese invasions in the 1940’s. 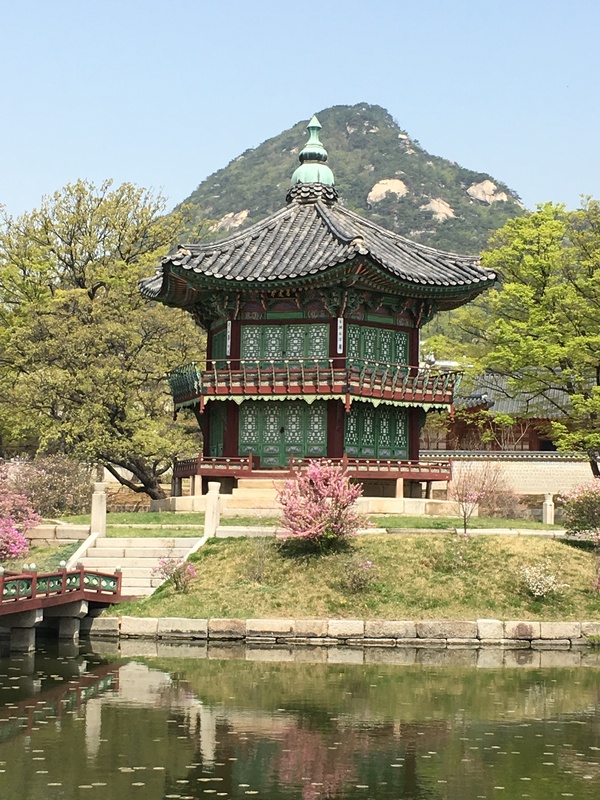 (Fun fact: A picture of this Pavilion was once on the Korean 10,000 won banknote.) The Pavilion is located on an island in the middle of a lake with 3 bridges for access. 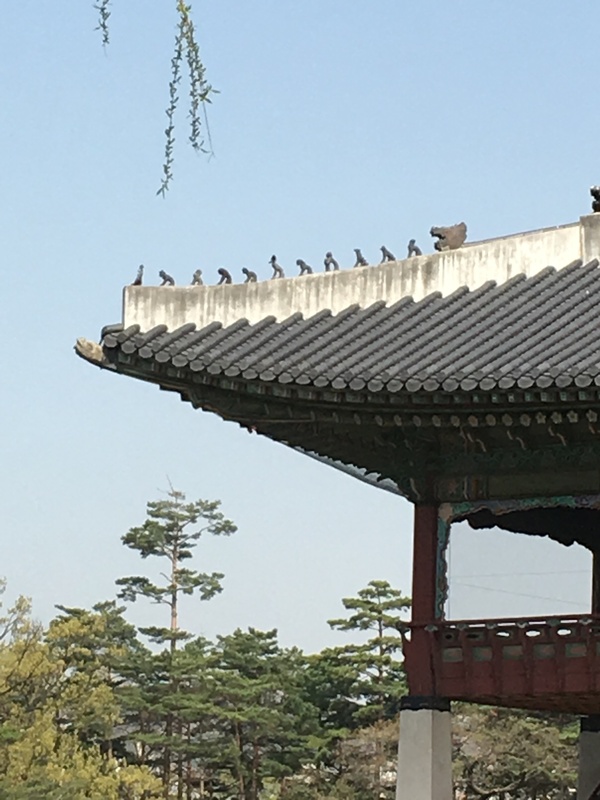 If you look really close, you’ll notice there are tiny figures on the edges of the roof. They are animals…12 of them…each one depicting one of the 12 zodiac signs. They also are believed to ward off evil spirits. 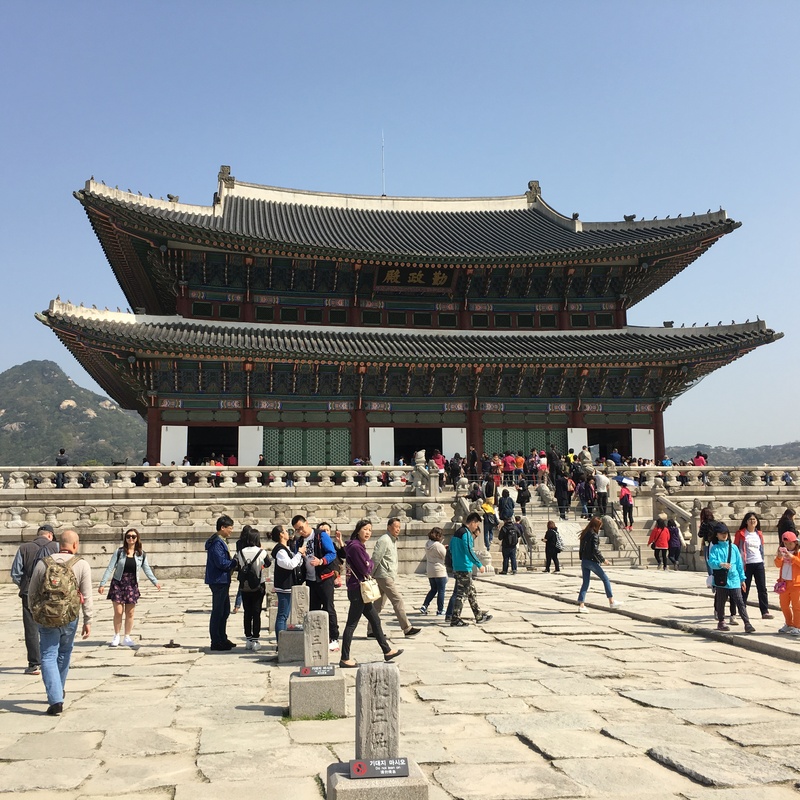 Farther back on the grounds are the royal residences for the King and the Queen….yes, they each had their own residence…one behind the other. 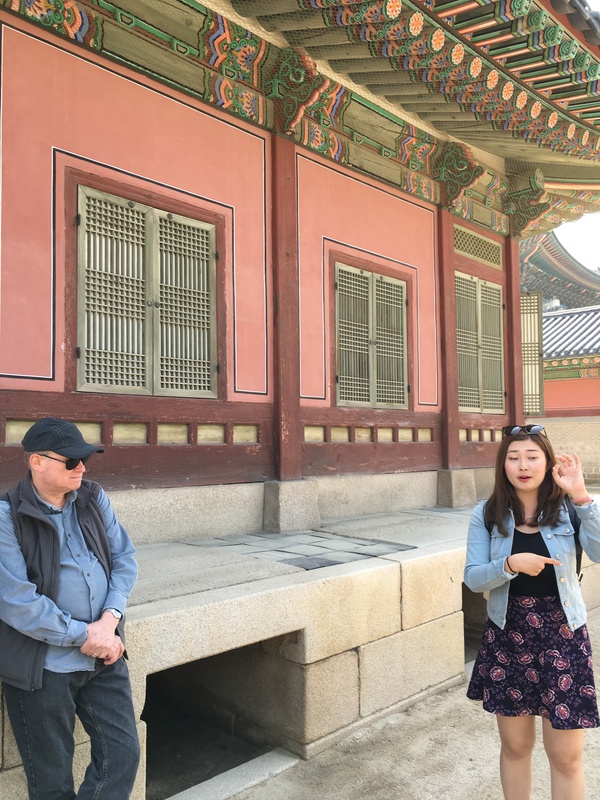 This is our tour guide explaining what these “holes” under the foundation are for….to heat the floor of course! 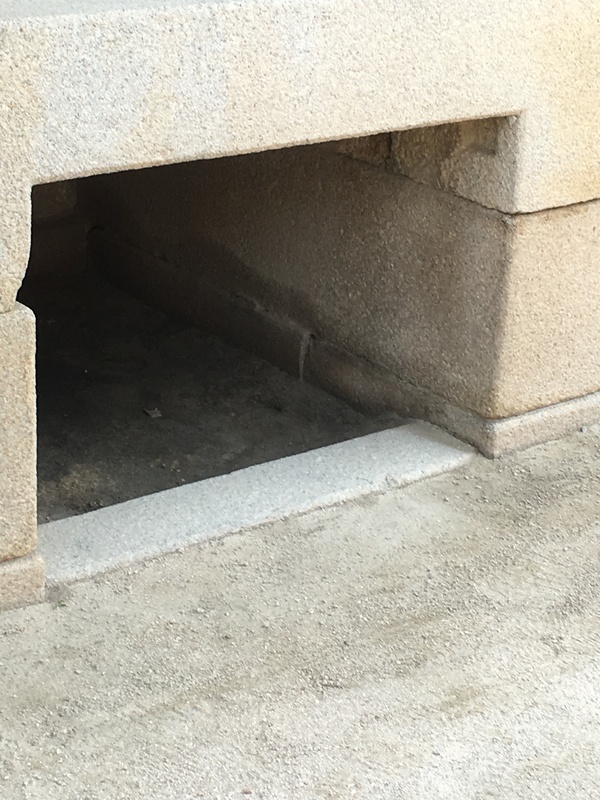 These “holes” are on all sides of the buildings and fires were built inside to heat the floors (and thus the buildings). 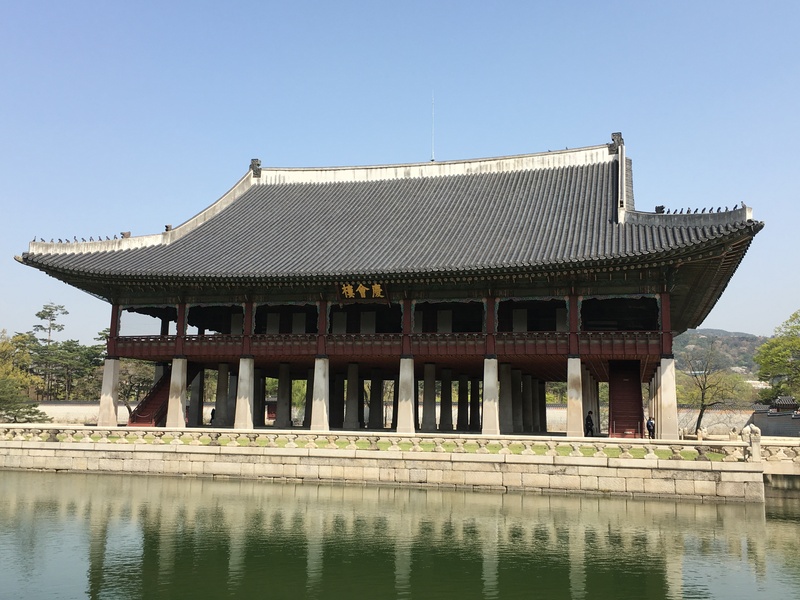 There are lots more buildings to see, but we were on our way now to the The National Folk Museum of Korea which is located on the palace grounds. This is a view of the museum looking through the trees. Because we were on a tour, we only got a quick look in the museum. 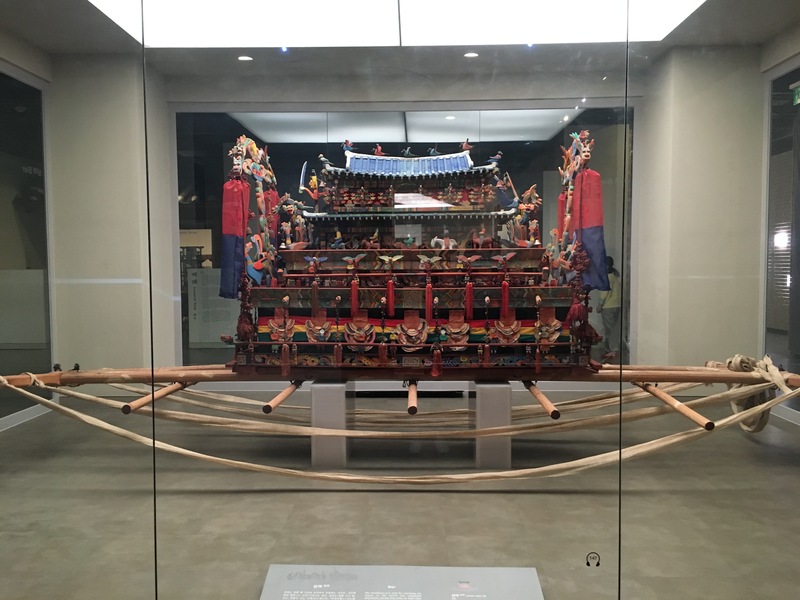 Two of the main exhibits focus on two important events in Korean life…marriages and funerals. 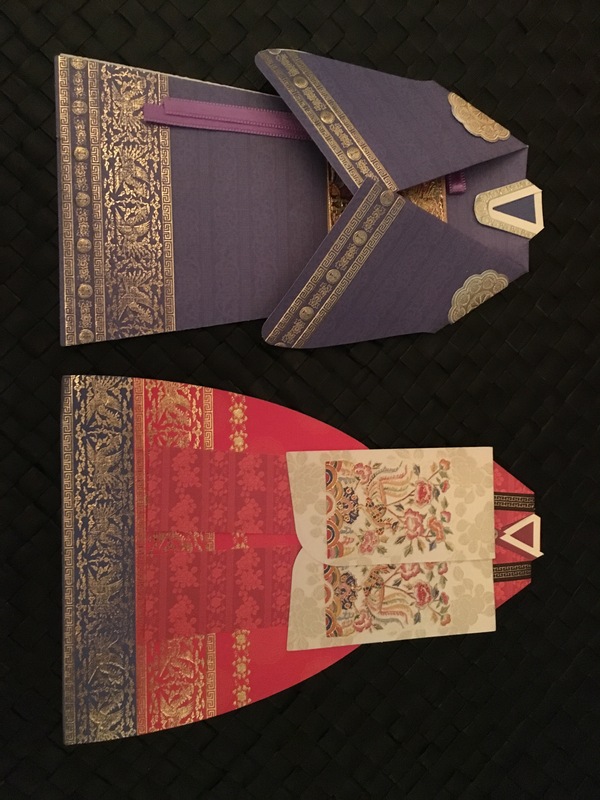 This is an example of Korean Wedding Costumes. After the marriage ceremony, the groom will typically ride a horse leading the processional through the streets while the bride is carried in this. Things can get even fancier for a funeral. 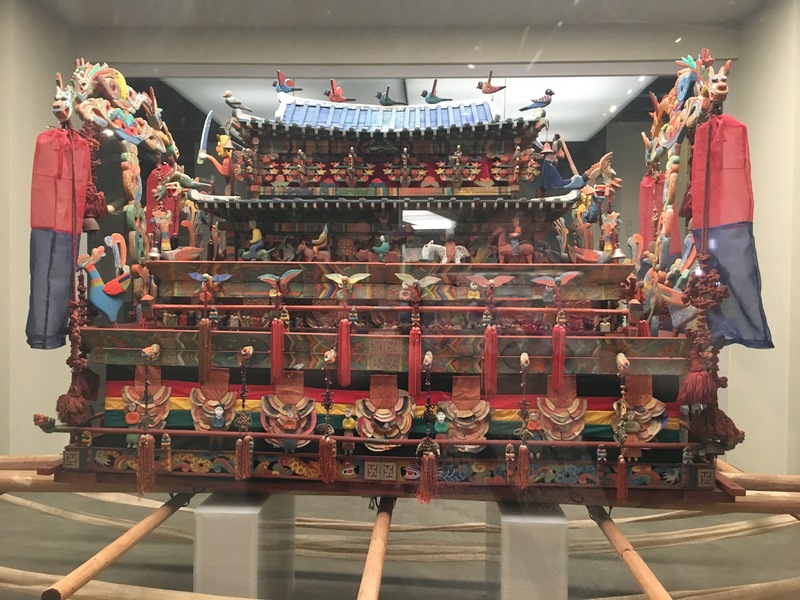 Below is an extreme example of a funeral “ark”. 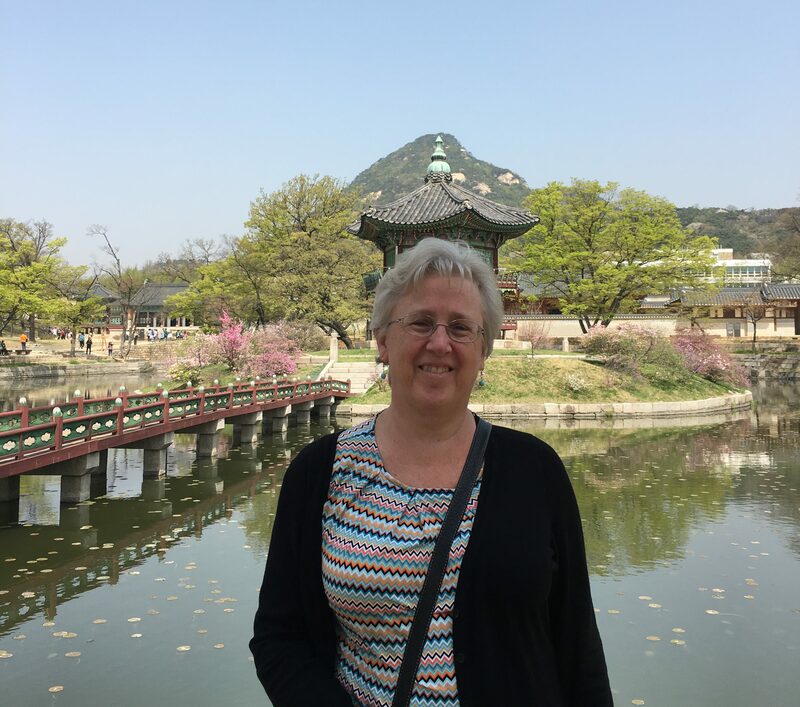 You can also try your hand at learning how to write some of the “letters” of the Hangul or Korean alphabet. 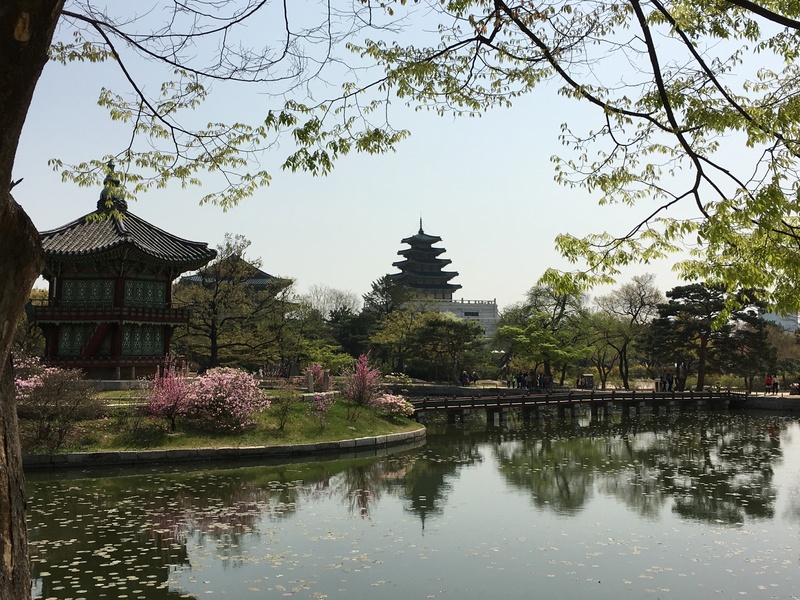 This is one place I would like to go back and explore more if I ever make it back to Seoul again. 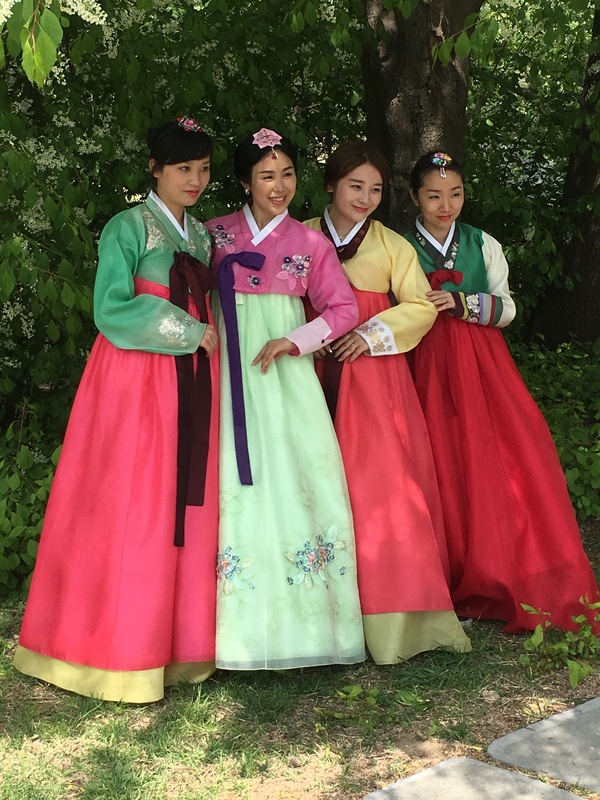 Outside the Folk Museum, we were lucky enough to see these four sisters in traditional Korean dress who kindly allowed us to take their picture. There is also a display of the Chinese zodiac. Each year in the 12 year cycle is represented by a small statue. 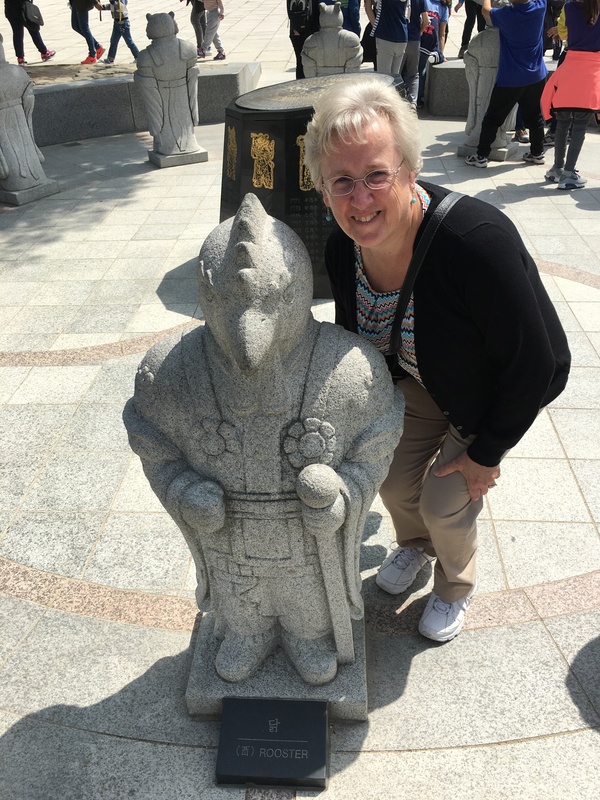 The year I was born is associated with the Year of the Rooster…so here I am posing with my “sign”. Our little tour group was on the move again…as we were walking to the next stop, we passed by this pavilion and did some quick picture taking. 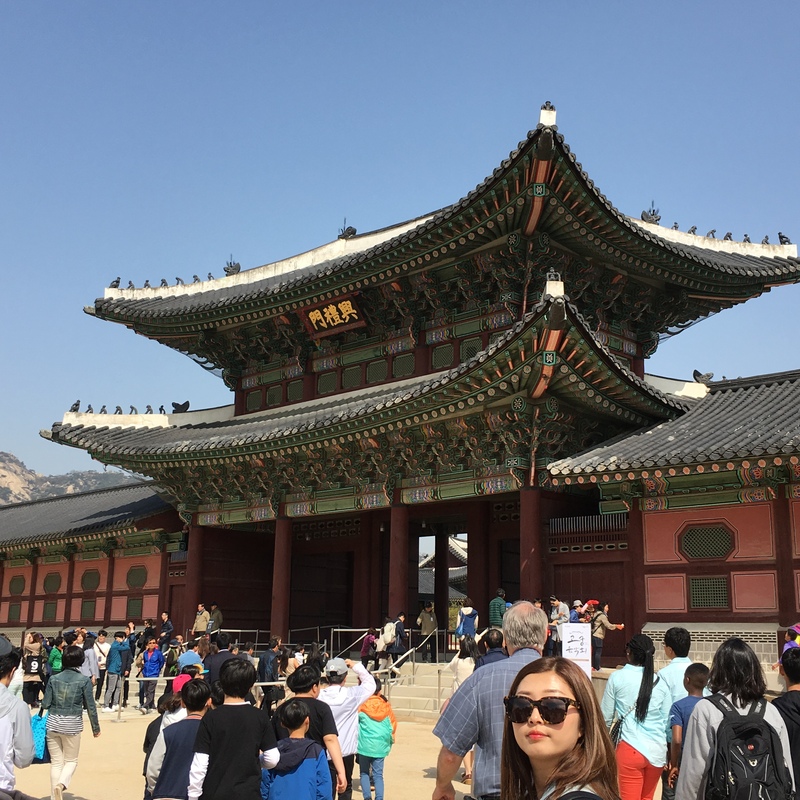 I had forgotten my “selfie stick”….Koreans LOVE their selfie sticksby the way….so this is what happens when the tour guide takes your picture….the top of the building becomes your “hat”. This is what is really behind me. 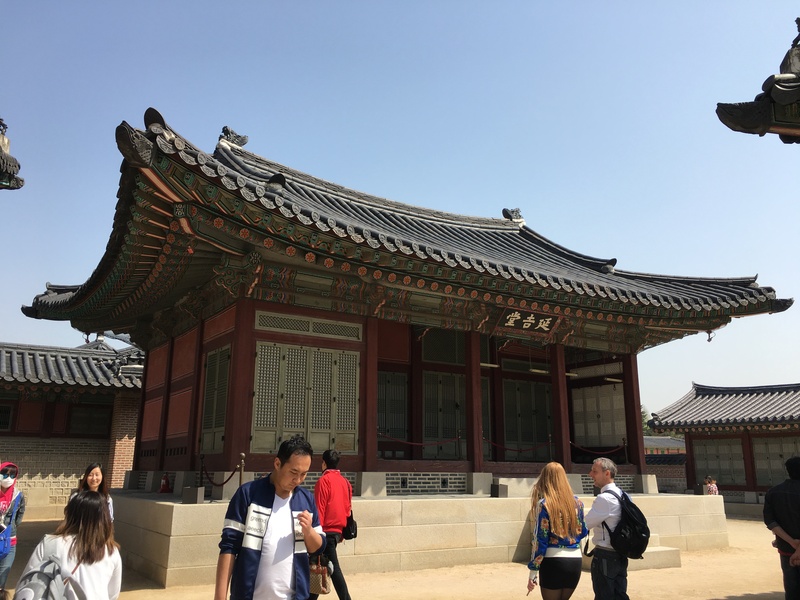 Our next stop is The Blue House or Cheong Wa Dae in Korean which means “pavilion of blue tiles”. 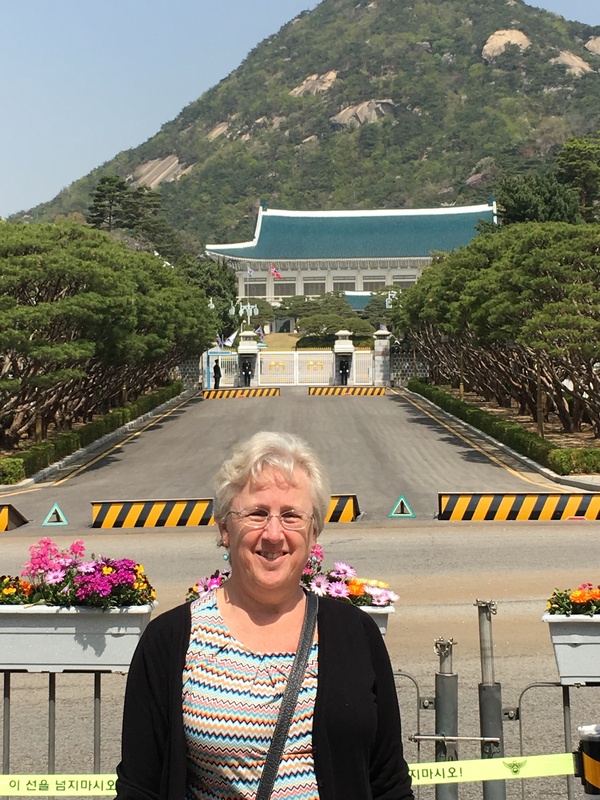 Just like The White House in the USA, The Blue House is the executive office and the home to the President of the Republic of Korea. 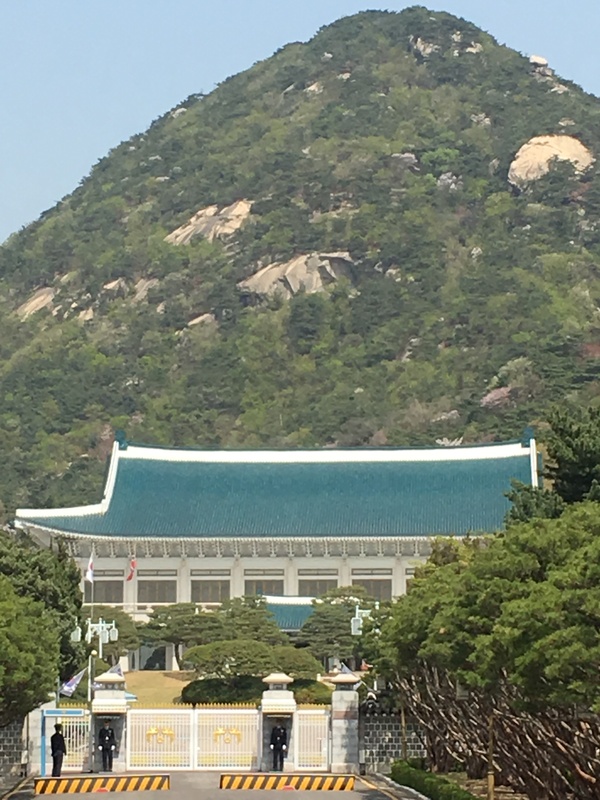 Although it’s called a “house”, it’s actually a complex of buildings including a Main Hall, the Presidential residence, a State Reception House, a Press Hall and plus more building that covers 62 acres! It’s very well guarded, so we are across the street gawking and taking pictures. 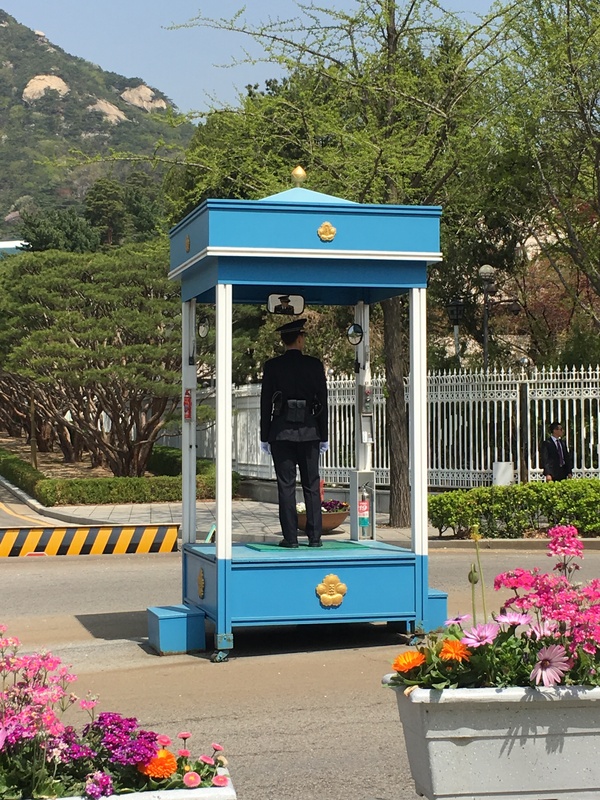 Down the street we went, past this traffic/sentry guard? 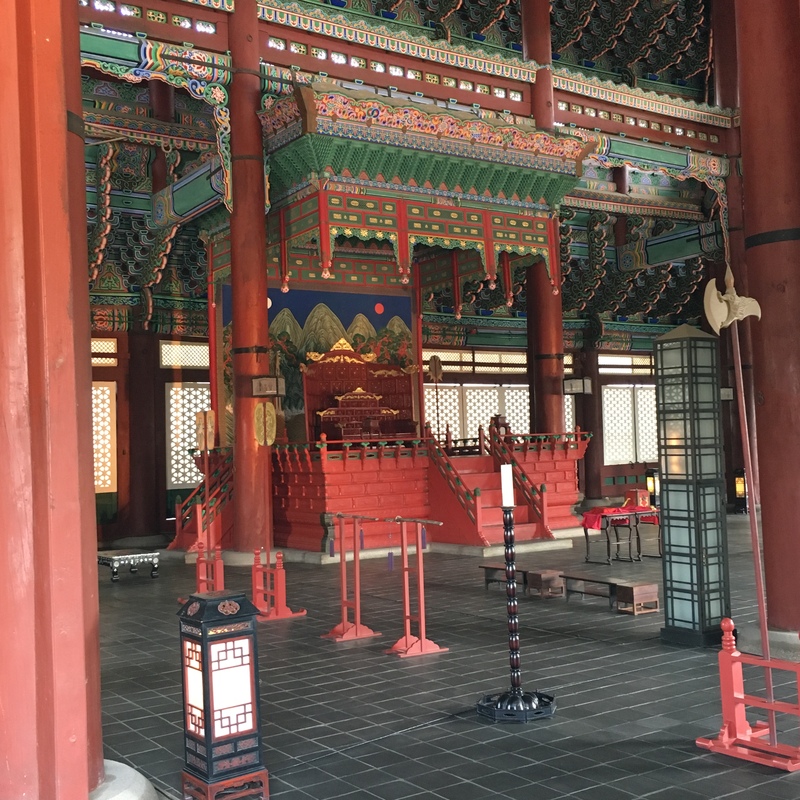 and then across the street to our last stop on the tour…Cheongwadae Hall. 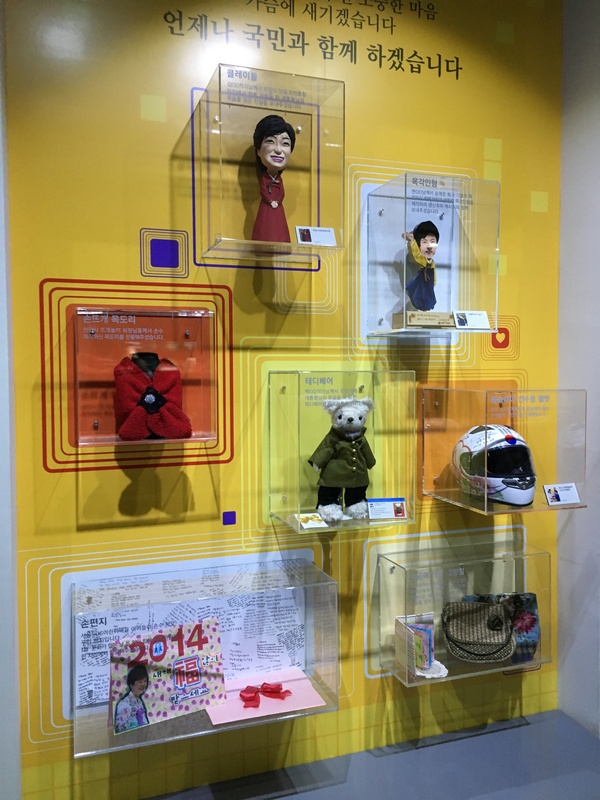 The displays here are constantly changing, but one of the permanent displays is something like a Hall of Presidents…where all the former and current presidents are on display, plus gifts given to the President from Korean citizens. 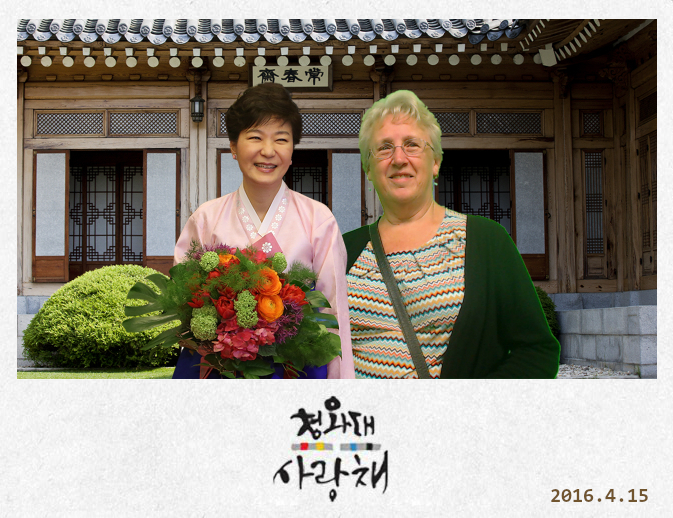 You can also get your picture taken with the current president, Park Geung-Hye. (via green screen technology, of course.) And we have now come to the end of our tour so it was back to the bus for the ride back to the USO. Thanks for sticking with me for this long post. I’m going to leave you with my favourite of the more than 200 pictures I took the day of this tour.